I took this photo 2 weeks prior to GEARS and decided to use it here, as it shows the kind of work Ken turns out. 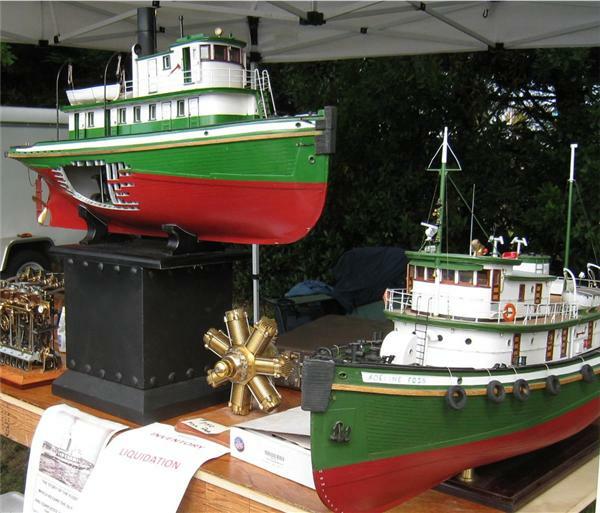 The tug on the stand is the last steam tug that Foss had and was named the Adeline Foss. She started out life in 1895 as the Flosie and was quite famous in rescuing many passengers of the steam ship 'Islander' in 1903 off the coast of Juneau. She was not a pretty tug and only had a 375hp compound in her. Later she became the Olympian and then was sold to Foss and named the Adeline, and laid up in 1946. Ken made the model from two photos which were the only ones he could find, and then installed a Stuart Compound that he had built in years past, and cut away a section of her hull so people could see the engine run and turn the propeller. He installed lights in the engine room and pilot house and a false boiler and work bench with tools in the engine room. The other tug is also named Adeline and she was a Miki desigh and one of nine that Foss purchased after the war and replaced the original Adeline. She is a static model, but with lots of detail in the pilot house. The 'radial' in the photo is a 6 cylinder steam engine that Ken sold for a friend.